Please add email@e.bullionvault.com to your address book or safe senders list. GOLD PRICES held flat against a falling Dollar in quiet trade Monday morning in London, slipping for non-US investors as President Donald Trump met Russia's Vladimir Putin for the first time, writes Steffen Grosshauser at BullionVault. After its biggest weekly rise in a month, the US Dollar fell 0.7% on the FX market versus its major peers. Gold recovered $5 of last week's $13 drop but remained range-bound close to Friday's 7-month low at $1237 per ounce. Asian shares fell along with the Chinese Yuan after data showed that GDP growth in the world's second-largest economy slowed to 6.7% per year in the second quarter as the new US import tariffs hit. Officials from the EU and China were set to hold talks today to discuss how to respond to the US tariffs. "Higher US Dollar, looming trade war between the US and China, downward adjustment in Eurozone outlook and the slide in the Chinese Yuan have contributed to price weakness," says a gold-price analysis from Dutch bank ABN Amro's Georgette Boele. But while Boele considers a further decrease to $1225 in Q3, she expects gold rise again to $1250 towards the end of the year. "Weakness in precious metal prices is not over yet, but prices are close to the bottom." 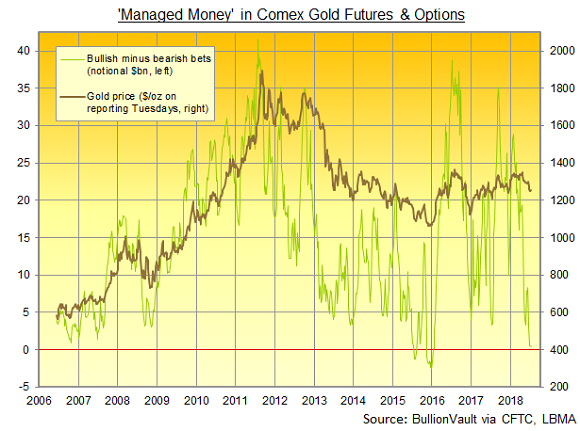 Hedge funds and other speculators trading Comex futures and options cut their net long position in gold by nearly 25% to a 2.5-year low in the week to 10 July, according to the latest data from US regulator the Commodity Futures Trading Commission (CFTC). The size of the metal-backed SPDR Gold Trust (NYSEArca:GLD) last week shrank by 7.1 tonnes to 785 tonnes. Its holdings have not seen any inflows for 11 weeks. Ahead of today's meeting with Putin, Trump said he will do "just fine" when asked by journalists whether he would confront the former KBG agent over claims of meddling in the 2016 US presidential election. "The Dollar has been traditionally a safe haven asset, and could be re-positioned as such especially if risk events and uncertainties continue to brew into the backdrop," reckons Singapore-listed bank OCBC's analyst Barnabas Gan. Like gold, silver also stayed around last week's close on Monday in London, trading at $15.81 per ounce after hitting a 7-month low at $15.73 on Thursday. PLEASE NOTE: This email is published to inform your thinking, not lead it. Only you can decide the best place for your money, and any decision you make will put your money at risk. Information or data included here may have already been overtaken by events - and must be verified elsewhere - should you choose to act on it. Copyright © BullionVault 2018, all rights reserved. You are welcome to forward this email to friends, but please do not post it on the internet. For news and views which you may republish online, contact our User Support team. 12th Floor Landmark House, Blacks Road, Hammersmith, London W6 9DP.